In a recent post I have guest-authored for the British Library Asian and African Studies Blog I was invited to write about some of the library’s manuscripts that I have found most inspiring. One of the manuscripts that I featured is a book of poetry made in Shiraz for a 15th century Turcoman prince called Pir Budaq. It first came to my notice a couple of years ago, when Barbara Brend selected it for viewing as part of a seminar, and I have been enthralled by the distinctive quality of its design ever since. 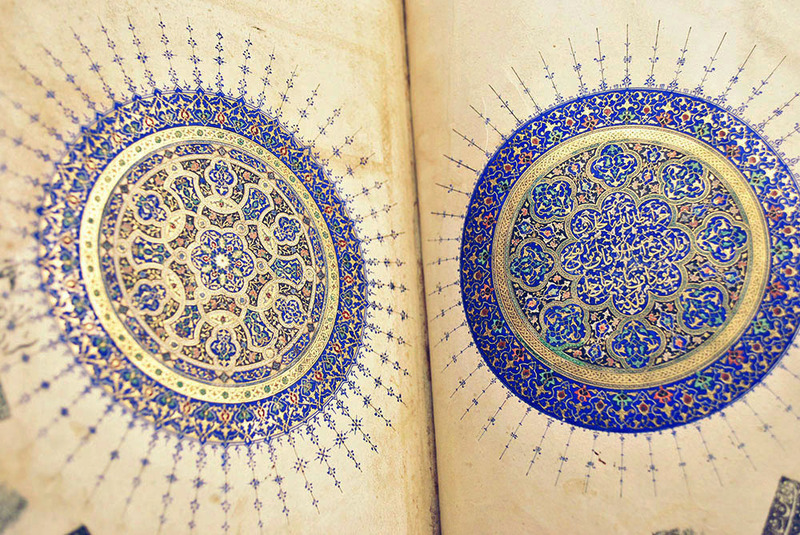 I have begun to make a study of the illumination of the opening ‘carpet’ pages, which I would like to share. 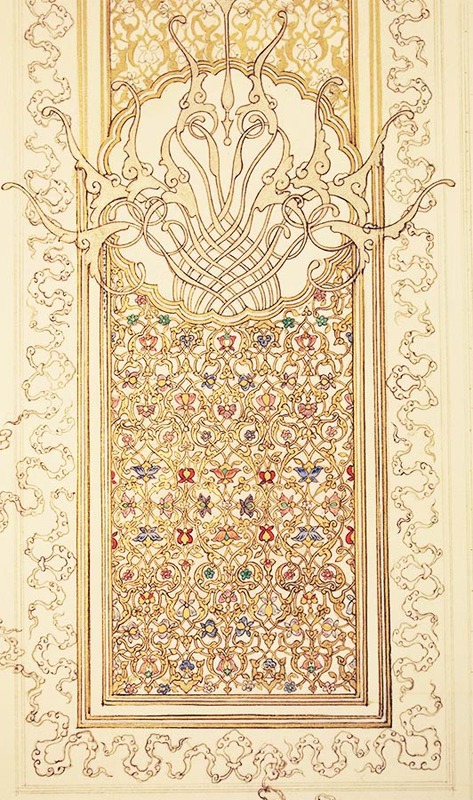 Divan of Hafez Sa’d copied for Pir Budaq, 1459, BL. Or 11846 ff.1-v, 2-r. Copyright of The British Library Board. The format of the manuscript leaves is unusually narrow in proportion to its height: h. 257mm X w. 130 mm, and the opening pages are completely filled with a dense network of formal arabesques executed with breathtaking precision. 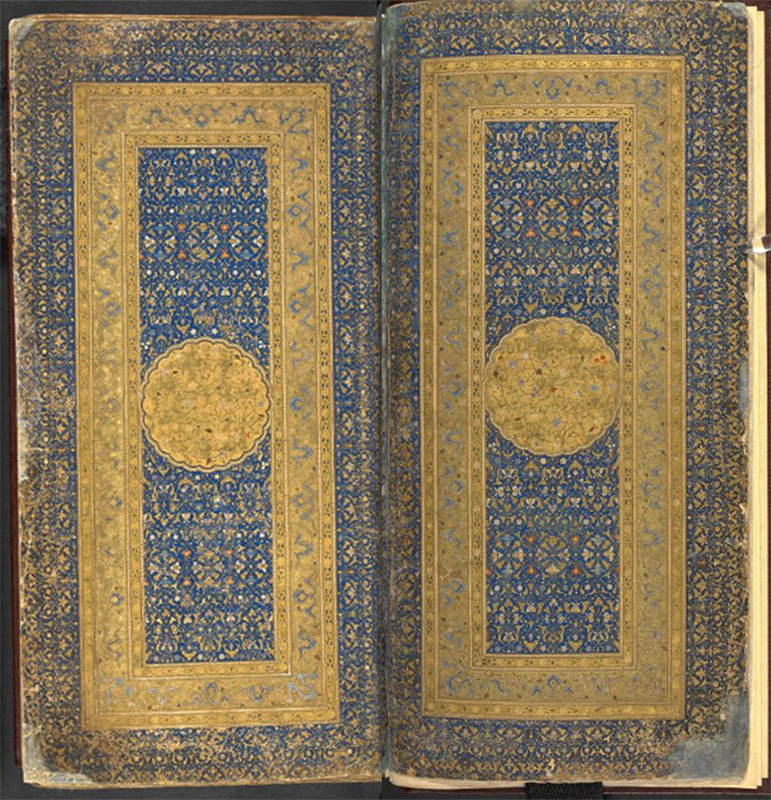 There is another manuscript made for Pir Budaq in the Bodleian Library, Oxford: a copy of the Ruba’iyat of ‘Omar Khayyam dated 1460, MS. Ouseley 140 in which the illuminations appear to have been done by the same hand. The illuminator is simply acknowledged at the end as “Pir Budaqi”, meaning that he worked for Pir Budaq. He worked in Shiraz, Iran. That’s all we know at present about the anonymous master illuminator. Pir Budaq himself was the son of Jahanshah Qaraqoyunlu, a Turcoman prince who ruled a small empire from Tabriz between 1439 and 1467. Pir Budaq was posted by his father as governor of Shiraz, where he proceeded to challenge the paternal sovereignty, until he was eventually marched on to Baghdad, and there killed in 1466. A short and violent career, which saw a minimal output of distinctive and sublimely beautiful manuscripts, of which Or. 11846 is one of the finest. 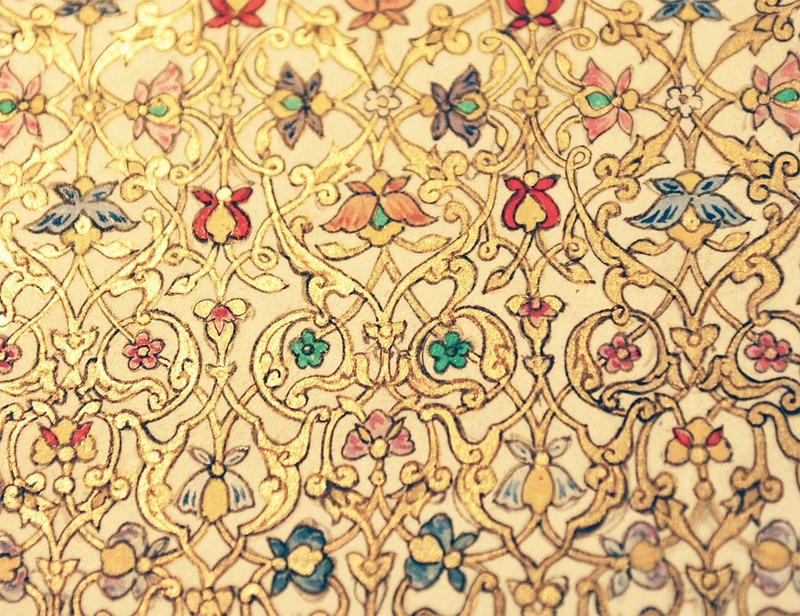 Detail of lattice design in Divan of Hafez Sa’d of Pir Budaq, BL mss Or. 11845 f. 1-r. Copyright of The British Library Board. The continuous lattice design, though complex, is obviously based on some sort of grid structure. 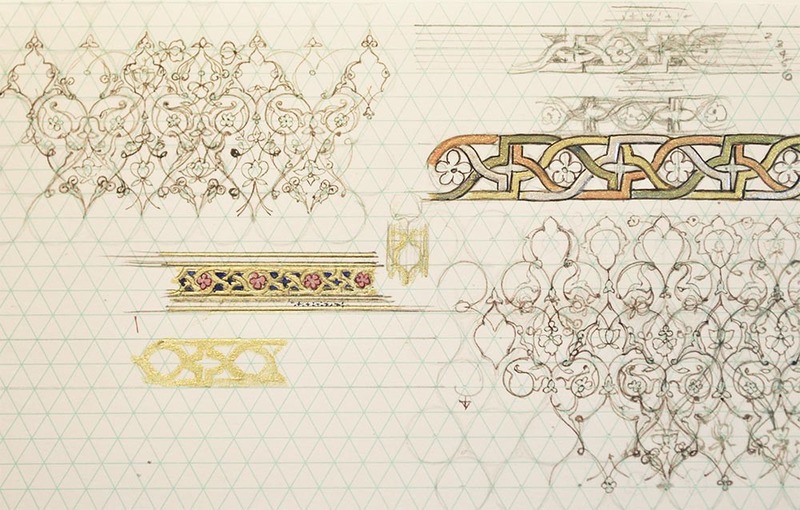 After a few false starts I concluded that a hexagonal grid, which can be read as an isometric grid, would be the most effective way of reconstructing the filigree of arabesques. The grid can also be read as packed circles, which helps to achieve the curvilinear quality of the lattice. Another challenge is working out the structure of the inner borders, which have a classic woven knot pattern. 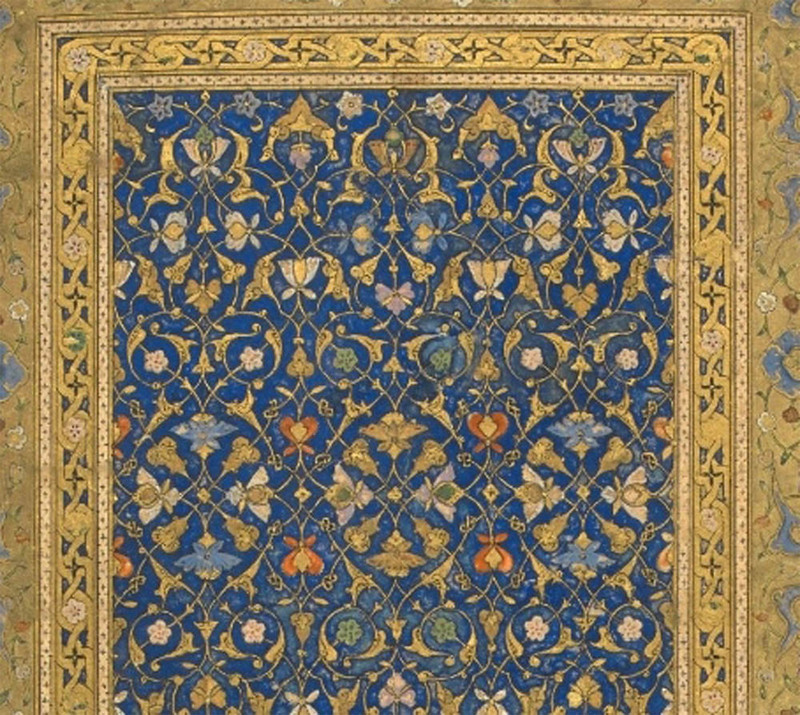 The primary design is composed of interwoven arabesques punctuated with stylized flowers – they have a specific ‘handwriting’ which is in part characteristic of the period, and part the idiosyncracies of the illuminator – there is a certain controlled eccentricity about the flourishes and the flowers that look like flies. Working out the structure of the designs. I blocked out the composition as a double page spread, roughly 30 % larger than the original, but still maintaining the original format, and I drafted in a grid of packed circles. Then, beginning with the main structural lines of the lattice design, I sketched in the design, first with light pencil, and then with a brush. 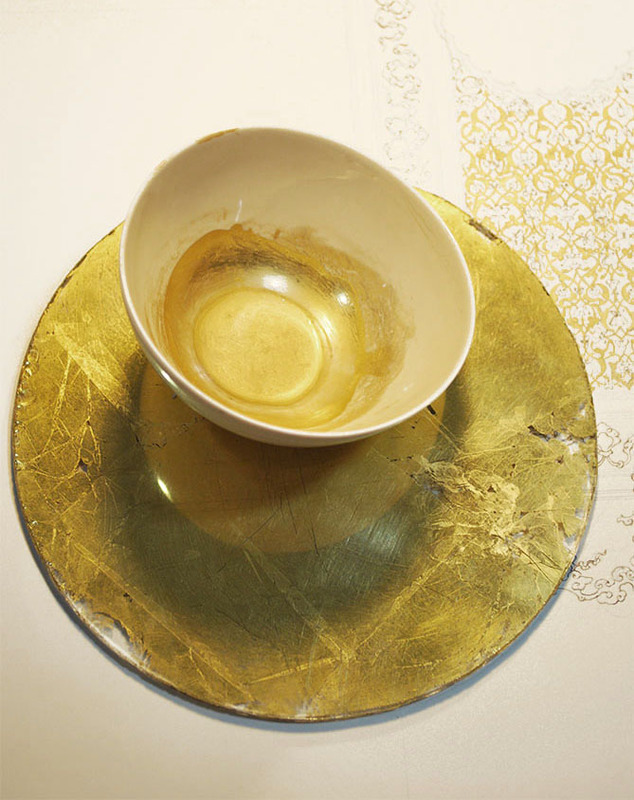 The design is then blocked in with shell gold, and burnished. 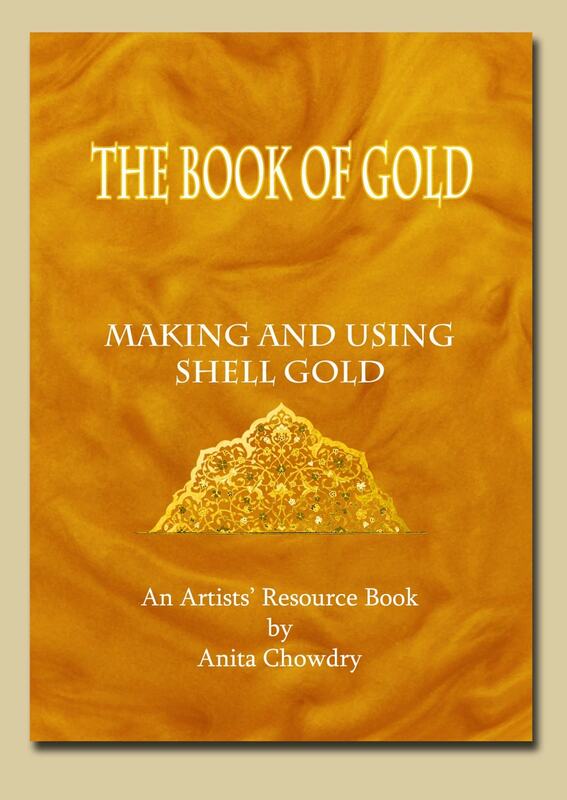 I can’t resist adding a picture of the shell gold I prepared specially for this project from two books of 24 carat leaf. I shall expect to need another two batches like this for the entire project. One of the biggest challenges in creating polished illuminated design is the ruling of lines. Elite manuscripts made in royal ateliers are distinguished by having faultlessly ruled lines, and that is a lot harder to do than it looks. I think they were done by specialist craftsmen who achieved mastery in this single process. There is a reference to drawing lines in an early 17th century Persian treatise, “Golestan-e Honar” by Qazi Ahmad, which states that “……the space left between the two (black) lines should be less than the back of a knife” That’s about a millimetre. The gold lines sit in between the black lines, and are done with a brush. Aargh! Tools for ruling lines. Left to right: a fine steel ruling-pen, a fine Japanese brush, a straight mongoose brush, a curved chipmunk brush, and an agate burnisher. For the black lines, I often use a delicate 19th century ruling pen, as they were made to be very fine and precise. Thick clumsy lines and the heavy inks of mid 20th century technical pens have no place in this kind of work. 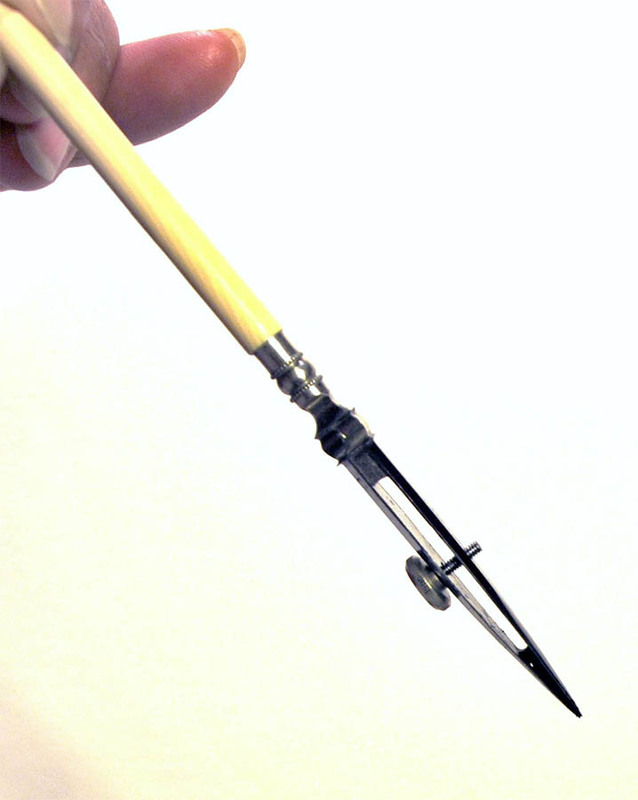 A traditional ruling-pen has two tapering steel flanges. The space between the tips, which determines the thickness of the line, is adjusted by means of a small screw. You load it with a drop of watery pigment or ink using a small brush. The ruling-pen loaded with a drop of watercolour pigment. 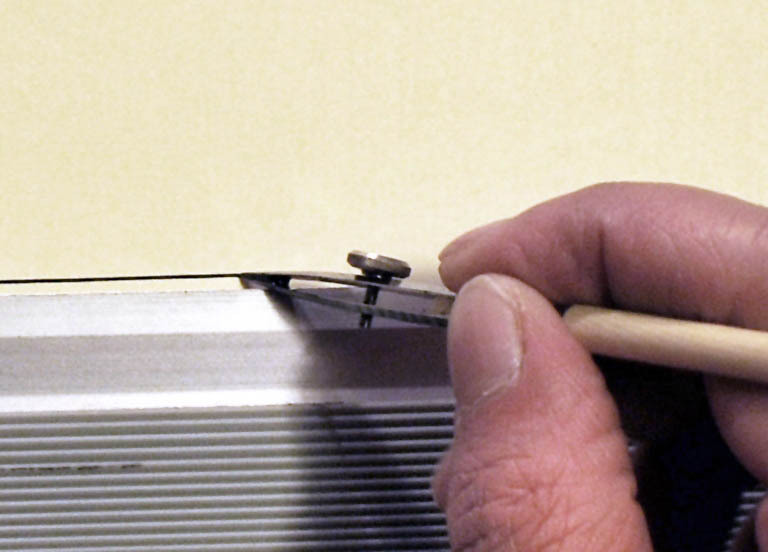 To rule a line, use a bevelled ruler, making sure that it is placed on the paper upside-down so that there is a space between the bevelled edge and the paper – this prevents blotting. Then you hold the loaded ruling pen upright on the paper, and wait for the ink to start flowing. Then draw it along using a light and steady pressure, fairly slowly so that the ink has time to run smoothly. Easier said than done, but it’s worth persevering. I have been unable to find an example of an Islamic ruling pen earlier than the late 18th century, so if anyone can throw any light on this I would be very grateful. For ruling lines with gold or mineral pigments it is best to use a firm straight brush with a blunt tip. It is important to get the consistency of the pigment right – it should be fairly liquid so that it can flow smoothly. Saturate the brush as much as possible without getting a drip at the end. Again, the bevelled ruler is placed on the paper upside down. 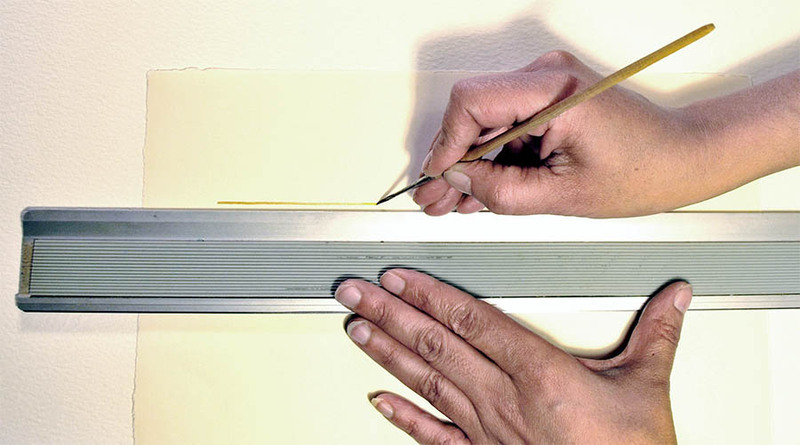 Use your fingers to create a buttress between the ruler-edge and the brush, and pull along smoothly and steadily. Any hesitation or distraction is fatal, so it is best to banish all attendant people when you are doing this! Ruling a gold line with a brush. 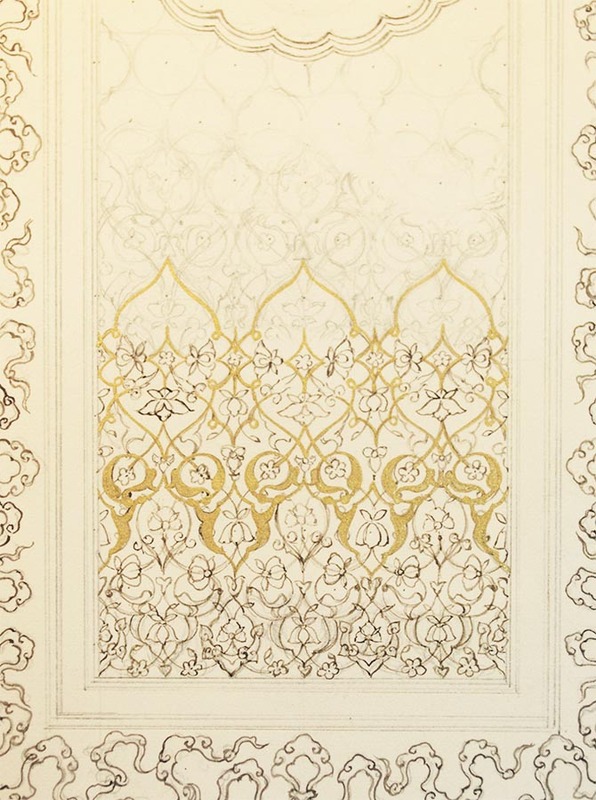 Getting back to the more organic arabesque filigree is a relief after doing the lines. 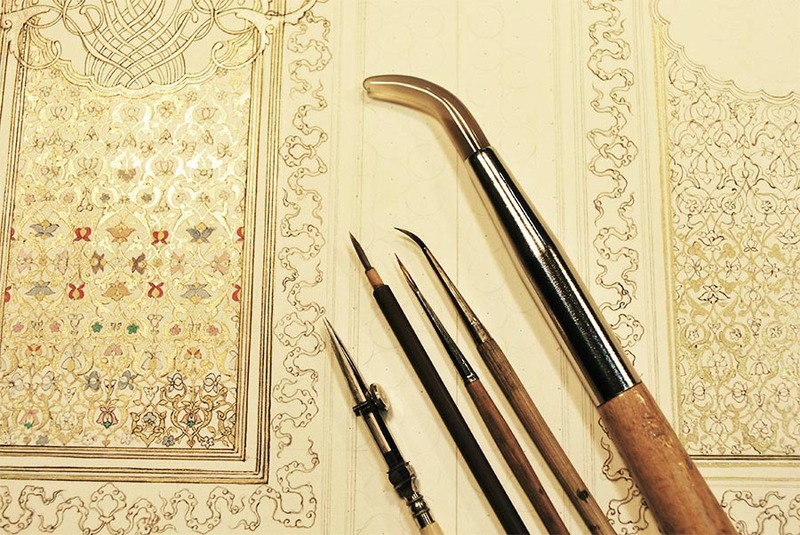 Once the gold has been blocked in and burnished, the tiny polychrome flowers are added, and the work is then refined and defined with outlines and flourishes. Then it is ready for the infill of the lapis lazuli ground, which goes in last, because it is very difficult to paint detail on top of lapis lazuli pigment. I have begun to improvise with the design, but it is important to start with a certain amount of rigour and to use the opportunity to learn from an historical masterpiece. As a colleague who is an architect so elegantly put it, you have to understand history as thoroughly as you can, so as to be able to move forward with integrity and depth. Thank you for your reply. I am illuminating a scroll for a member of the sca.org in the kingdom of Ealdormere and find the filigree work so beautiful and appreciate your analysis of the method. Mostly the original work is so beautiful that it is beyond understanding. This work is so beautiful that I have been inspired to hunt for more and found the Alhambra in Spain and have fallen in love with it. I am planning a trip to Spain to see it in person within the next couple of years! Thankyou so much Joan. I would also like to see the Alhambra!